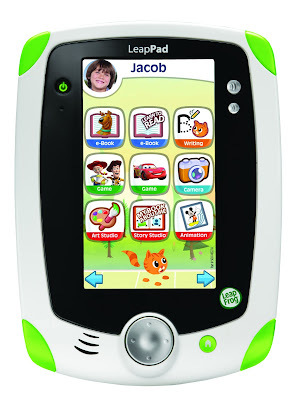 Life Unexpected: Win a LeapPad1 with LeapFrog! She would love this as she always snuggles up and plays on daddy and big bro's ipads, would be so cool for her to have her own version!!! she would love it as it is a great learning tool and as she will be 4 it would be perfect!! I'd give it to my daughter to stop the fighting between the children over the one my son has! I would love to win this for my 3 year old as it means I might get my iPad back from him! They are always trying to play on our i phones - it might be able to get on it if we have one of these! Bud would absolutely love this. He uses our phones and my Kindle Fire and is quite adept on them. He would love his own Leap Pad to play on so he wouldn't have to queue for ours! My niece would love this. She loves learning and playing games! often trying to take my iPhone to play. Lara is desperate for a 'tablet' of her own, plus it would keep her off mine!! My little man would love this - he's dying to get his hands on my iPad, but something like this would be far more suitable! As She Has always wanted a console and this is would be more educational which we would be more happy with. I might get my ipad back if my little man had one of these to play with!? Would make my little one feel very grown up.....their very own gadget! I may actually be able to get my phone back if my son won this! My little boy would really love this- he is already fascinated with my touchscreen phone and want it to play games (thankfully I have downloaded educational ones! )...and this would be his own with far greater interactive learning on a bigger screen and a wonderful present for him! My son just loves pressing buttons and especially messing about with my iPad. It would be great to give him his own gadget to play with for a change! My little grandson has just turned 3 and started nursery so this great prize would keep his mind stimulated. My little one is currently obsessed with trying to grab my new Google tablet when I'm not looking so it would be great for her to have her own child friendly device! MY little boy is always stealing my phone to play games, so I know he would love this! He loves banging away on the laptop - so this would save me some money on constant repairs due to missing keys! My son is very inquisitive and always wants to use my laptop,Leappad1 would be a welcome distraction. My son could be like me and daddy with our tabs! My 5yr old son would absolutely LOVE this as he is a mad gamer. This would be perfect to help him with school-work as-well. And perhaps me and my fiance can have a go on the X-box! My poor younger son is always getting shoved off our computer by his big brother so he'd LOVE to have this all to himself! My little ones would love this so they can copy daddy on his computer. my little girl would feel so grown up with one of these. My twin nieces would fight over this! Because they are always asking if they can have their own "ipad" and this would be perfect! Harri is very much like his mum , loves a gadget ! he is so keen to learn at the moment and this would be perfect for him. Freddy loves anything to do with technology! I'd love to win this for my little grandson so that he can have a computer just like his two big brothers - a fantastic prize! I have just found out that I am going to be a Grandad for the 1st time, so very excited, would love to win this to put away for "little'un"
these look great and would get my little one off my ipod touch! My daughter would love this because she would think she had her own tablet and leave her Dad's alone. My grandaughter Chloe would love it as something special of her own that she didn't have to share with her baby sister Olivia! Because they are always on my Ipad and it would be great to have something more age appropriate. He loves learning & will love the camera/video recorder on it aswell.. he is always trying to play with my camera..
My little one would stop biting his older brother when fighting over the ipad. My little one would love this as he loves playing with my phone and ipad. My son loves playing on my phone and has dropped it so many times, thankfully I've had a cover on it so the only thing that has broke is the cover! This would be ideal for him as he looks after everything of "his" - and with his birthday in a few weeks, could be a lovely little surprise for him! My son would love this because he's always stealing my iPad! Because her sister has a tablet and she really wants one so this prize would be perfect. Both of mine would adore this as they are both fascinated by learning and theres so much on here to support that! I think the hundreds of games, digital books, videos and flash cards would keep any little one entertained. I think both my son and niece would have a go on this. My little boy loves to learn and he also likes playing games, this combines both in a fun yet educational way. My little girl would love this. She loves the computer and it would be nice for her to have something of her own to play on. Fab prize! She'd love it as she loves playing with apps on my phone, I'd love it so I could regain a hold on my phone! My daughter had a late start in learning due to health issues so this would really help her and she would love it. Dylan is just getting to the age where he really wants to learn and I think he would love his very own computer! They love anything technical! Having 3 there would always be one on it! She would love to be just like us and haver own little computer. My daughter loves our tablet, so I'm sure she'd really love a little tablet of her own. My son would love this LeapPad. he would love having a tablet like grandas! This looks like a great introduction to a tablet! My little one would love it as it'd be like having his own iphone and stop him from taking mine! Son is always trying to sneak off with my phone or tablet, he would be so pleased to have one of his own. My daughter would like her own "ipad"
She'd love this as it's like a big mobile phone and all she ever does she walk around with my phone! Because he would love to compare it with tablet games to see if these ones are any more educational! He loved his leapster handheld game but is getting a bit bored of it and this would be more challenging for him. Well my daughter would love this because she is always playing with mummys ipad and would love to have her own. My daughter would love this, it would stop her trying to use daddy's and it's kiddy friendly so I wouldn't have to worry about her breaking daddy's! my little would love this!!!! it looks interesting and different from other toys out there! My 3 year old grandson would love this . its noisy and lights up and mostly of all educational fun!! my daughter loves to learn, and she loves playing with her grans iPad. An iPad is a but advanced but I think this would be perfect for her! What A Great Offer! Really Pleased for the Winner of this Product. my daughter would love this, loves playing on phones and all techno stuff, would be ideal. My monkey is obsessed with the ipad so this would go down a treat! My son is still a little young but in a few months this'd be perfect for him. It also means he'd keep his sticky hands of my iPad! Leapfrog Tag system is great and I would love to give my 5yr old a leapPad. I would give this to my god daughter Sophie, so when we have our weekly play dates together I can help her learn. My son is completely obsessed by our IPADs. It would be great for him to have his own!! My son would love a tablet of his own, just like mummy and daddy. It would help to satisfy my little girl's innate curiosity about the world around her. My little girl would love this because of the games and cartoon characters! My 2yo is always on my iPad so would love this. I think she would especially love taking pictures. I would love this for my Grandson and Granddaughter, they would love it. The things they bring out now are fantastic. Thank you for the competition. My little girl would love to have a tablet just for herself. I love that it's just tailored to kids. My little boy would love to have his own tablet to play with. My little man just wants to always play on his older brothers tablet he got for Christmas! My daughter would love this, she is so inquisative and always trying to use my phone and laptop, this would really give her an undertsnading of everay technology. My little boy would love this as his big sister has an innotab and he always wants a shot so this would be something different for him, he would love playing games on it! My little one has just started to become interested in technology. So this would be great for him. My grandson would love this better than my phone. My 5yo would love this as I'm always using the computer whenever she wants to go on it. My girls would love it any thing that looks technical seems to draw them like a magnet! My daughter loves my ipad but I know she would love to have her very own kids friendly one. I'd love my son to have this so that he could have fun and learn at the same time. She loves banging around on my laptop so she'd adore this! My little boy would love this as he loves my ipad he would love a tablet of his own. My son is always trying to get hold of his big brothers games consoles and im sure he'd love one thats just for him! Because she love gadgets of any kind. She is fascinated by them!! It would stop her pinching my ipad!!! My son is obsessed with my phone & laptop and would love his own 'big boy' computer. My little one squeals with delight everytime she sees me or her dad on a picture so i can only begin to imagine the reaction if she was able to record us on here. Unfortunetly i don't have children but my best friend's little girl Julie who's 4 would love this, she loves learning, and maybe it would keep her away from her mummy's laptop, she's getting gadget crazy so her own little gadget would be great! because she's becoming quite the gadget queen in our household! Because Marcus loves any gadget and loves to learn. My daughter would love this as we got her brother a tablet for his birthday and now she wants one! My kids would love this they like playing games and this would give me a little peace for a bit!